Unit designed for Class I, Division I, Group D location service. 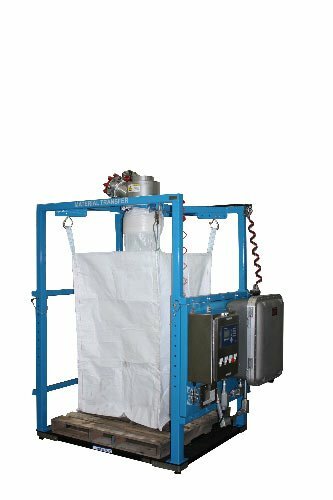 Unit features an adjustable height structural support frame and bag strap hooks to accommodate bulk bag size variances. 316L stainless steel product contact surfaces. Unit has a 2,500# capacity. Fill head features a port to accept customer supplied nitrogen for bag inflation. Unit features a NEMA 7/9 explosion proof junction box. NEMA 4X control enclosure features a panel mounted Mettler-Toledo digital weight indicator.